The American Short Line and Regional Railroad Association (ASLRRA) presented several annual awards at the 2018 CONNECTIONS Convention in Nashville. And one of its executives became the first League of Railway Women Hall of Fame inductee. The Safety Person of the Year award “recognizes an employee of a member railroad who is not a career safety professional, has no reportable personal injuries, works with their company to make safety programs effective, exhibits a high degree of safety awareness, and contributes off-duty time to activities promoting safety awareness and initiatives in the community,” ASLRRA noted. Before coming to LIRC, Kramer held management positions with CN. He joined the U.S. Army Reserve in 2004 and worked closely with the U.S. Department of State and FRA during the creation of the Afghan Railroad Administration. Kramer has volunteered his time with Operation Lifesaver, and has worked with area first responders in a variety of programs such as Trauma Camp, a training event for area first responders in a mock train vs. vehicle incident; the Hazmat Safety Train, which provides classroom education and hands-on training to enhance their effectiveness in response to potential railcar accidents and chemical releases; and Officer on a Train, an effort to prevent grade crossing and trespasser incidents. In addition to his community, Kramer has “raised the safety culture bar” with LIRC contractors who support the operation. Click HERE to see ASLRRA’s video on Kramer. The Safety Professional of the Year is awarded each year to the railroad management employee “who demonstrates an exceptional work ethic and dedication to safety.” Mitch Harris, RGPC Director Safety, Training and Regulatory Compliance, began his railroad career as a conductor and engineer. Harris also serves ASLRRA as Vice Chair of the Safety and Training Committee, and as an alternate member of FRA’s Railroad Safety Advisory Committee (RSAC). To be honored with a Jake Award, an ASLRRA member railroad must perform better than the Class II and III industry average injury frequency rate as reported by the FRA during the prior year. Jake Award winners “with distinction” also have an FRA-reportable injury-free performance during the same time. Jake Awards are awarded at ASLRRA’s regional fall conferences. 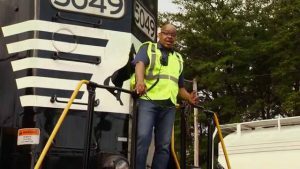 Click HERE to see ASLRRA’s video on Harris. LIRC won an ASLRRA 2018 Marketing Award for its efforts expanding rail service to an Indiana National Guard training facility in central Indiana, and also ASLRRA’s annual Timmons Award for the railroad’s commitment to hiring military veterans. LIRC’s work with the Indiana National Guard greatly expanded the outfit’s capability to transport military equipment on railroad flatcars from its newly expanded installation at Camp Atterbury. The site serves a large-scale U.S. Army training facility in central Indiana that in recent years has been repurposed to become a primary proving ground. 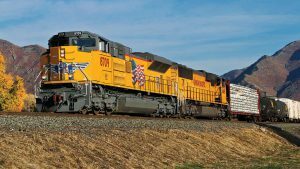 The Indiana National Guard initially approached LIRC about partnering on a new nine-track rail loading facility. Design, construction, and rail operations planning took place over a five-year period. The effort culminated in the summer of 2017, when, over the course of one week, more than 300 flatcars were successfully and safely loaded at Camp Atterbury and assembled into three unit trains for a brigade-scale movement of home units to Fort Polk, La. The three trains returned a week later. The project was completed during a time of peak demand for flatcars. LIRC also won ASLRRA’s Timmons Award for the second year in a row. 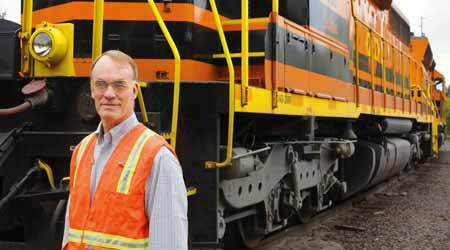 In 2017, the railroad employed the highest percentage of veterans (29.6%) and the highest percentage of veteran new hires (30.0%) among ASLRRA member railroads. Veterans initiatives include special lapel pins for new hires with military service, applying large logos on two of its locomotives to commemorate veterans, and donating money to Kentucky Indiana Paralyzed Veterans for materials to construct a new deck at the organization’s center in Jeffersonville, Ind. Several LIRC employees volunteered to build the deck. For the fourth time in the past eight years, the Reading, Blue Mountain & Northern Railroad (RBMN) won an ASLRRA Marketing Award, this time for its efforts to connect a large anthracite coal producer, Atlantic Coal, Hazleton, Pa., to the national railroad network. The project was “made more complicated,” RBMN said, because Atlantic Coal’s facility is located on Norfolk Southern. 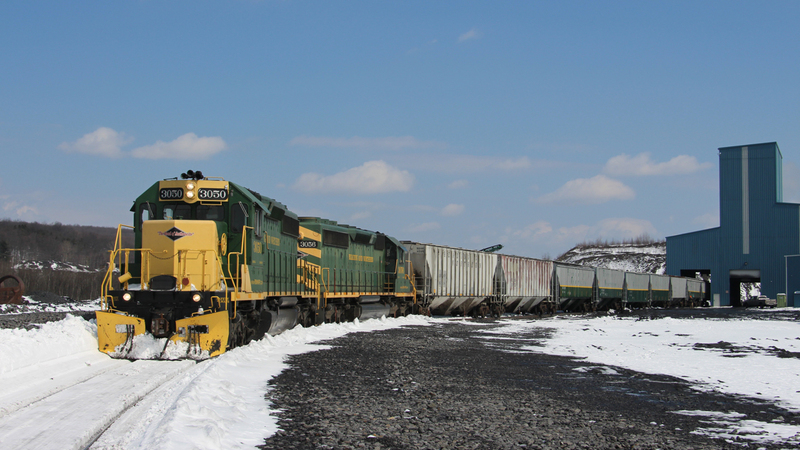 RBMN has trackage rights on the NS line, and with the active support of the NS Coal Business Group, received approval to connect to the facility. In its first partial year of operation, Atlantic Coal shipped more than 500 carloads of anthracite. The company anticipates it will soon be shipping in excess of 2,000 carloads a year, removing more than 8,000 trucks from local roads and highways. ASLRRA presented the Thomas L. Schlosser Distinguished Service Award to Mortimer “Mort” Fuller III for his 40 years of service to the short line industry. The award is presented annually to “an individual who has demonstrated long-term, significant service.” to the ASLRRA at the CONNECTIONS 2018 Conference in Nashville, Tennessee. In the late 1980s, Fuller was a founding member of the Regional Railroads of America (RRA), described as “a group of a dozen short line railroaders that sought to change a variety of New Deal-era laws that treated railroads differently than all other industries.” RRA gradually grew in size and prominence as a short line lobbying organization. In 1997, Fuller took the lead in arranging a 1997 merger between the RRA and the American Short Line Railroad Association into ASLRRA. “Today, legislative advocacy is a key benefit of ASLRRA membership, led by the Legislative Policy Committee,” the organization noted. Fuller became G&W CEO, President and Chairman in 1977, when he purchased a controlling interest the in original Genesee & Wyoming Railroad, which his great-grandfather founded in 1899. He served as G&W’s CEO for 30 years and Chairman for 40 years. 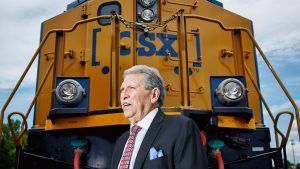 “Throughout his tenure, he demonstrated an unwavering focus on growth and laid the foundation for the company’s core purpose: to be the safest and most respected rail service provider in the world,” Hellmann said. Under Fuller’s tenure, G&W grew from a 14-mile short line railroad in upstate New York with 1977 revenues of $4.4 million to a portfolio of 122 freight railroads worldwide with 2016 revenues of $2 billion. 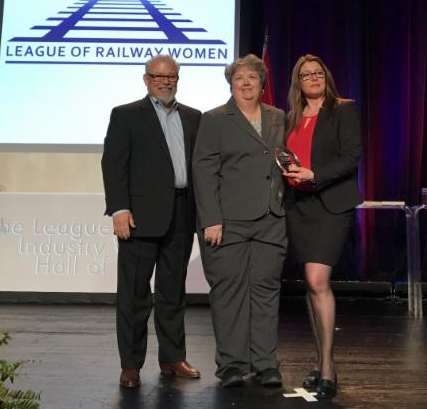 The League of Railway Women (LRW) named ASLRRA Vice President of Member Engagement & Sales Kathy Keeney as the first inductee into the LRW Hall of Fame with its inaugural award during the General Session of the 2018 ASLRRA Connections conference. Described as “a seasoned transportation executive with expertise in publishing, sales, marketing and finance,” Keeney joined ASLRRA in 2015. Prior to that, she was Rail Publisher for the JOC Group, Inc., UBM Global Trade and Commonwealth Business Media, and served as an executive and writer for other rail industry trade publications. Involved with LRW since joining in 1998, one year after the organization was founded, she has held a number of board positions, including Scholarship Director, Vice President and President.